On 12 and 13 March 2018, the international event International Days of Competences for the Future (IDCF) was held for the first time. 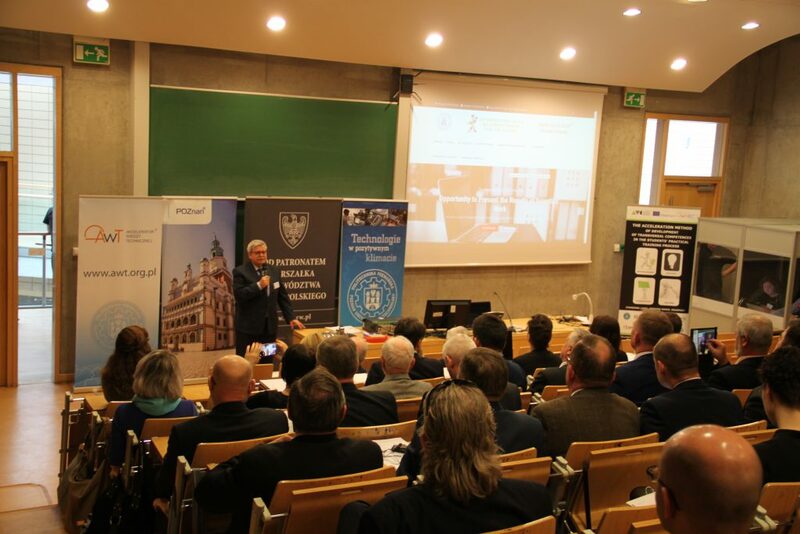 The event was held at the Poznań University of Technology Lecture and Conference Center and was organized by the Poznań University of Technology and the Faculty of Management Engineering at the Poznan University of Technology, with the support of the Poznan University of Technology Initiative – Technical Knowledge Accelerator®. The main theme of IDCF was broadly understood management. Particular emphasis has been placed on competences for the future. New technologies are changing the labor market. Artificial intelligence (AI), neural networks, machine learning, robotics, IVR (Interactive Voice Response) and NLP (natural language processing) systems are developing rapidly. The changes concern not only the field of computerization and automation, but also other creative industries. The issues related to, among others, knowledge management and skills management were also discussed; skills and competences in the organization, intelligent organization, intelligent factory; quality in the context of competency management and knowledge management; methods of accelerating the acquisition of cross-cutting competences, including: communication skills, teamwork, entrepreneurship and creativity; as well as leadership and problems of process automation 4.0. 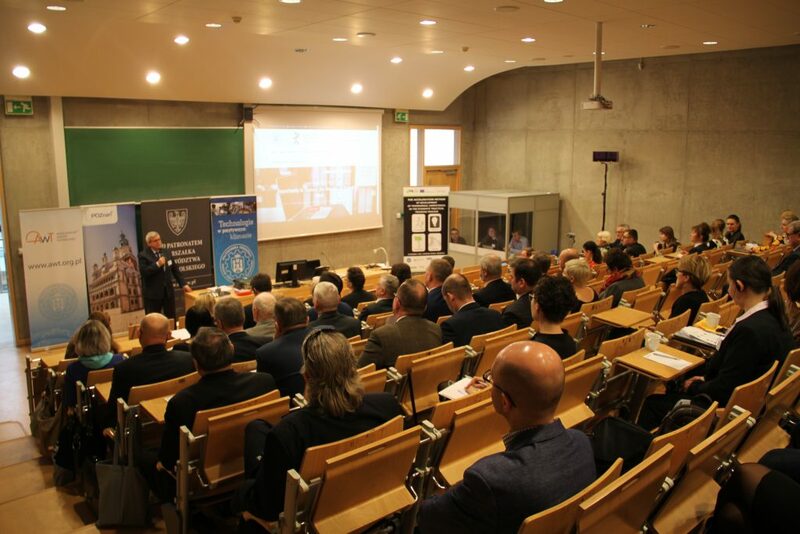 The IDCF was attended by people representing universities and companies from around the world, including the University of Economics in Wroclaw (Poland), the Częstochowa University of Technology (Poland), Centria University of Applied Sciences (Finland), University of Maribor – Faculty of Economics and Business (Slovenia) , Matej Bel University Banska Bystrica (Slovakia), West Chamber of Commerce and Industry in Gorzów Wlkp., The Federation of Education in Jokilaaksot – JEDU (Finland), Poltava National Technical Yuri Kondratyuk University (Ukraine). International days of competence were supported by MAHLE Behr Ostrów Wielkopolski Sp. z o.o. and Schaltbau RAWAG. 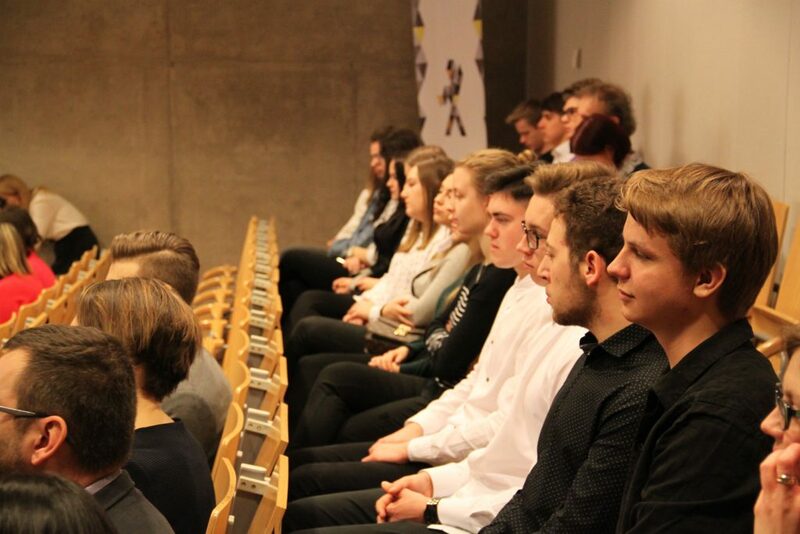 The event was honored by the presence of academic teachers from the Poznan University of Technology. On the first day there were workshops for entrepreneurs and representatives of educational institutions involved in the creation of the Wielkopolska Network of Education and Economy. The workshops were conducted in Polish and English. Entrepreneurs who came to the workshop are involved in the project “Time for professionals BIS – Professional Wielkopolska”, which was launched under the Wielkopolska Regional Operational Program 2014+ and will be implemented by the end of 2022 by the Wielkopolska Regional Government (Department of Education and Science, Office of the Marshal of Wielkopolska Region) and the Poznan University of Technology in cooperation with interested self-governments, employers and schools educating professionally from the area of the Wielkopolskie voivodship.– Workshops are always well received by participants – says PhD. Eng. Magdalena Graczyk – Kucharska, from the Faculty of Engineering Management – This form of cooperation and the exchange of experiences and insights is the most fruitful – he adds. – We meet some of the companies at the next workshops. Representatives of MAHLE Behr Ostrów Wielkopolski Sp. z o.o. and Schaltbau RAWAG participate in many such meetings, and this is the best proof for us that the reception of participants is positive – says PhD. Eng. Marek Goliński from the Faculty of Engineering Management – The relationships we have been building with the Wielkopolska companies have been built by us for many years – he adds. – Always work during the workshop evokes a lot of emotions – says PhD. Eng. Maciej Szafrański from the Faculty of Engineering Management – Appropriate moderation of the meeting allows you to keep working in certain frameworks established before the meeting – he adds. It was a novelty to maintain the workshops in the atmosphere of an international meeting. – It was a great opportunity to practice English – says Klaudyna Bogurska-Matys, relationship specialist in the project “Time for Professionals BIS – Professional Wielkopolska” – Exchange of opinions and presenting problems that turned out to be transnational and common discussion caused a real storm brains – he adds. PhD. Eng. Maciej Szafrański, PhD. Eng. Marek Goliński, PhD. Eng. Małgorzata Spychała and PhD. Eng. Magdalena Graczyk – Kucharska, leading – scientists from Poznan University of Technology, Faculty of Engineering Management, will prepare a report summarizing the meeting during the workshops, during which the most important competences of the future manager are discussed. The first day ended with an open lecture by an American scientist, Scott Erickson, a professor of marketing at the School of Business at Ithaca College, Ithaca, NY “Organizational Learning and Knowledge Management in the Age of Big Data”. Scott Erickson was greeted by Professor PhD. DsC. Joanna Józefowska, Vice-Rector for Science, who in an interesting way brought closer the figure of an American scientist to the gathered guests and students. The Rector greeted and thanked everyone involved in organizing this meeting. The professor introduced well-known companies in the US that use the data collected by the company. He showed how the data is collected, which often even the client has no idea and what is later used by large corporations. As he pointed out, the information was still underestimated 20 years ago, and no one thought that following the movements and decisions of the client would be of great importance. Only now, collecting, storing, analyzing and using this data in marketing, as he admits himself, is quite frightening. – I was most surprised by the example of a company that can analyze its customers’ movements and shopping behavior so accurately that they guess when a woman is pregnant and adjust the offers she receives on her computer to this information – says Ania, a student of the Faculty of Engineering Management – Even a question has been asked from one student how to defend against it. Nobody, however, could say that in the room. I guess you can not stop this whole machine anymore.- We are very happy that Professor Scott Ericson accepted our invitation to IDCF – says PhD. Eng. Magdalena Graczyk – Kucharska, from the Faculty of Engineering Management – It is always a great event for us, making foreign, very good specialists with whom we cooperate and exchange experiences. We were also happy with the full room. Students are eager to take part in this type of lectures – he adds. 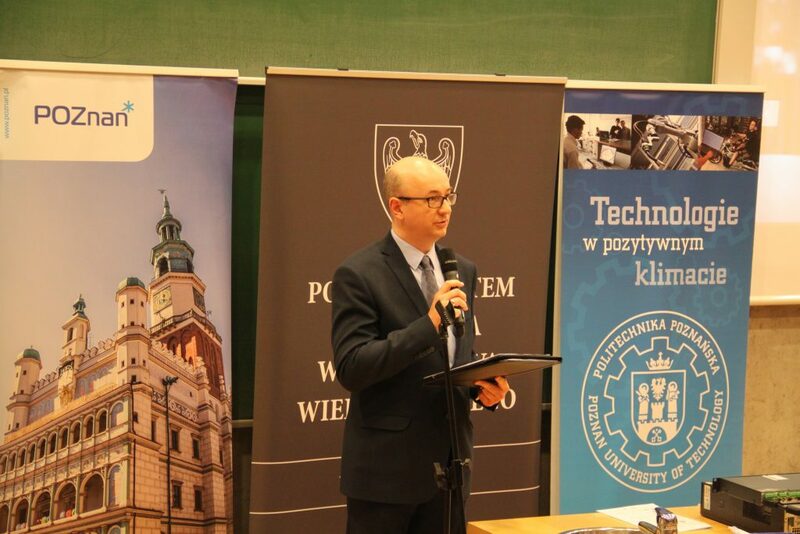 – The Professor was impressed by the conference and workshops organized by the Poznan University of Technology. The city also liked him. On his map of places to visit, after the Old Market Square, Fara, he wanted to see the “Porta Posnania Gate” – says PhD. Eng. Marek Goliński from the Faculty of Engineering Management. – With Professor Scott Ericson, we met during a scientific conference in Spain – says PhD. Eng. Maciej Szafrański from the Faculty of Engineering Management – Our meeting in Poznan only sealed our further scientific work, which is great. Scott Erickson has published many books and articles on Big Data and business analytics, intellectual capital and knowledge management as well as competitive intelligence. His new book, New Methods in Marketing Research and Analytics, was recently published by Edward Elgar. On the second day an international conference was held under the name “The acceleration method of development of transversal competences – results of research and analysis”. The event was addressed to scientists, students, representatives of enterprises and institutions related to education and the labor market. The conference was solemnly opened by Professor. PhD. DsC. Tomasz Łodygowski, Rector of Poznan University of Technology, who warmly welcomed all the guests and presented a film promoting the University. Then the following spoke: Professor PhD. DsC. Magdalena Wyrwicka, Dean of the Faculty of Engineering Management and PhD. Eng. Maciej Szafrański, from the Faculty of Engineering Management. The organizers of the event welcomed guests with a warm word from abroad and from Poland. They thanked all those involved in the organization of this event, persons and institutions that have taken them under the honorary patronage of: Marek Woźniak, Marshal of the Greater Poland Region, Jacek Jaśkowiak, President of the City of Poznan, Polish Academy of Sciences represented by prof. Zenon Wiśniewski – and Media Patron: Editorial Office of Greater Poland, Radio Poznan and TVP3 Poznan. During the plenary session, PhD. Eng. Maciej Szafrański presented the Method developed in the project ATC Erasmus + – “The acceleration method of development of transversal competences in the students – practical training process”, Professor Gerhard-William Weber from Poznan University of Technology, Poland, presented the theme “Knowledge Acceleration by Competences and Multivariate Adaptive Regression Splines”. – The conference was very well evaluated by foreign foreign and polish guests- says PhD. Eng. Magdalena Graczyk-Kucharska, from the Faculty of Engineering Management. The conference was attended by scientists from the USA, Finland, Slovakia, Slovenia and Ukraine. During the sessions and workshops, among others topics, discussed took place about the results of work on the developed method of accelerating the acquisition of cross-cutting competences. – Dr Liisa Timonen from Karelia University of Applied Sciences in Joensuu, Finland, presented the opinion on the Method and reflections related to education, which is also the aftermath of the ECMT + project – says PhD. Eng. Marek Goliński from the Faculty of Engineering Management – It is really constructive when during the session we can together discuss, exchange information, plan. The best proof of the fact that the topics of the speeches and the results of the conducted research were so interesting is that further talks were already taking place in the corridors. – Conversations with our partners at transnational meetings are always fruitful and bring something new – says PhD. Eng. Maciej Szafrański from the Faculty of Engineering Management – What was nice was the keen interest in our work in the project by other scientists, not involved in the ATC / Erasmus + project – he adds. Most of the conference participants’ speeches can be followed on Facebook Accelerate Transversal Competences, where live broadcasts were made. In addition, a video promoting the event will be released soon. It will also be possible to see the speeches from the Plenary Session and Session 1 – the information will be also posted on Facebook.